Throughout written history there have been many abrupt ends to empires and civilizations that have little explanation. Political climates deteriorate, passions rise, revolts happen and the next thing you know--the culture is a thing of the past relegated to a short chapter in a textbook. The natural world leaves a record in the form of tree rings, which can be read like a very detailed book, covering a long period of human history. 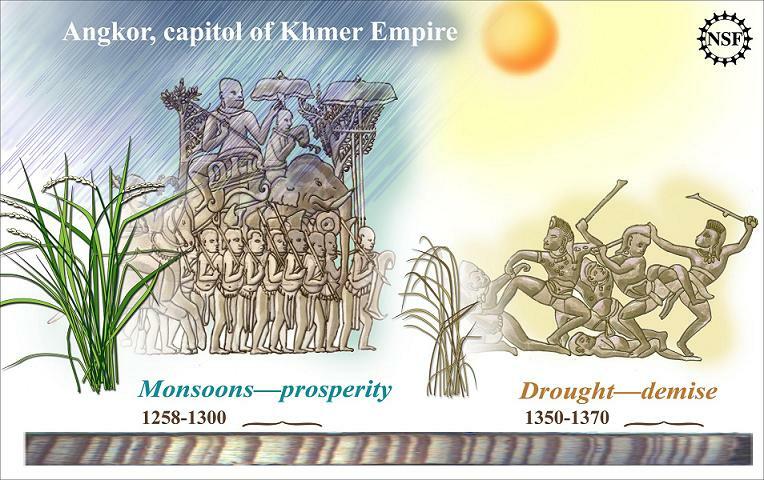 Now a team of researchers has correlated the demise of Angkor, the capitol of the Khmer Empire in Cambodia, with a decades-long drought interspersed with intense monsoons in the 14th and 15th centuries. Brendan Buckley of Lamont-Doherty Earth Observatory of Columbia University and his colleagues have put together a high-resolution record of periods of drought and moisture in Southeast Asia that is over three quarters of a millennium long from 1250 to 2008 AD. Their research was funded by the National Science Foundation's Paleoclimate Program, which is part of the directorate for geosciences. Just as satellite photos do--large sets of information like this tree ring data bring into focus patterns and phenomena that are larger than one lifetime. In fact they are on the scale of civilizations. A look at tree ring data, and an analysis of rain, drought and temperature can show a remarkable link from climate in the environment to climate in the king's court. And this has been shown to be true for the enigmatic demise of Angkor, an empire that stood strong from the 9th to 13th centuries. Angkor was a city that relied heavily on water. The National Science Foundation-funded work of Buckley and his colleagues reveals that the mid- to late 1300's experienced persistently dry conditions that spanned decades, followed by several years of severe wetness that may have caused damage to the city's infrastructure. Afterwards, a shorter but more severe drought in the early 1400's may have been more than this urban complex could handle. Bringing insights such as these into focus in the 21st century, there is a sense of urgency in interpreting what the natural world is telling us. The very cypress trees (Fokienia hodginsii) that allow the long-range glimpse backwards are becoming more and more rare as their wood is harvested for the illicit timber trade. The highlands of Vietnam and Laos are home to some of the region's most diverse biota, and are under threat of over-exploitation.